... do subscribe to the RSS feed if you like what you see thusfar. 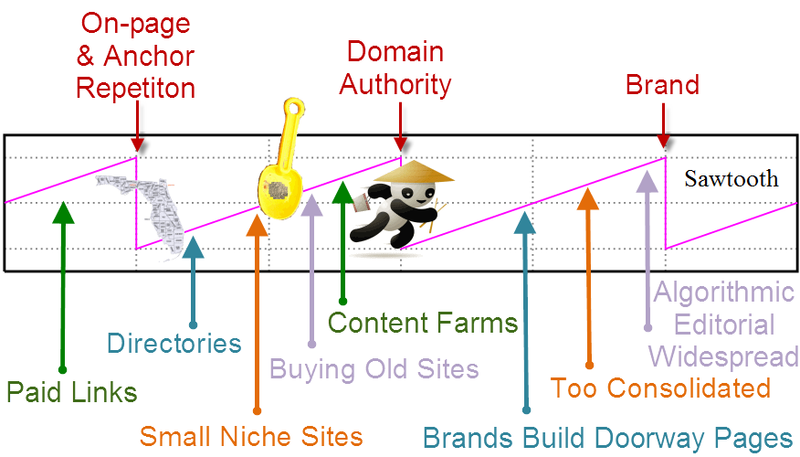 Some people newer to the field & a bit lower down on the pyramid are lucky/smart enough to join our community too & those who do so and participate likely save anywhere from 1 to 3 years on their learning curve...leveling up quickly in the game/sport of SEO. But by and large our customers are mostly the expert end of the market. We could try to water down the community & site to try to make it more mass market, but I think that would take the site's leading strength and flush it down the toilet. In the short run it would mean growth, but it would also make the community less enjoyable ... and this site is as much a labor of love as it is a business. I think I would burn myself out & no longer love it if the site became noisy & every third post was about the keyword density of meta tags. When there are big changes in the industry we are usually early in discussing them. We were writing about exact match domains back in 2006 and when Google's algorithm hinted at a future of strong brand preference we mentioned that back in 2009. With that being said, many people are not nimble enough to take advantage of some of the shifts & many people still need solid foundational SEO 101 in place before the exceptions & more advanced topics make sense. The following images either make sense almost instantly, or they look like they are in Greek...depending on one's experience in the field of SEO. My guess is my mom is a pretty good reflection of most of the market in understanding page titles, keywords, and so on...but maybe not knowing a lot about anchor text filters, link velocity, extrapolating where algorithm updates might create future problems & how Google might then respond to those, etc. And most people who only incidentally touch the SEO market don't need to get a PhD in the topic in order to reach the point of diminishing returns. I know we chat about it, but I love the in-depth pieces far more than the infographics that convey 1/3 as much of the actual information. Thank you for your hard work in making this a place I enjoy coming to. I personally am excited to see how this new site develops. I came into my seo link building in-house position knowing very little about SEO, but with the ambition and excitement to learn. I am basically learning as I go! Sometimes the information out there is either completely too detailed, or extremely obvious - so I hope this fits somewhere nicely in the middle. Glad to see you guys pushing out more information and to try and educate the general public.